Oriental bittersweet, identified by its YELLOW capsules around the berries. Is this killer vine in my backyard? The Minnesota Department of Agriculture reports it was confirmed in the Twin Cities metropolitan area in 2010, and since then has been found in multiple counties. A particularly severe infestation was discovered in Red Wing and Winona in Southeastern Minnesota. UMN Extension and Conservation Corps Minnesota have coordinated efforts to educate property owners and help attack the problem neighborhood by neighborhood. Don't compost it, don't use it--because birds can eat the berries and spread it around your landscape! It strangles trees with its heavy vines--in fact, experts recommend not even to pull down the vine because the vines are so heavy, they could injure a person standing below. American bittersweet vs. the Oriental bittersweet is key. So how do I identify it? 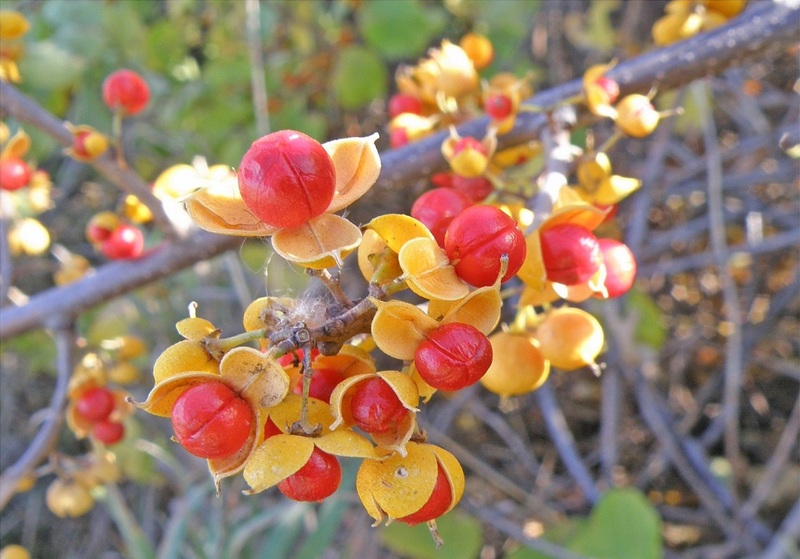 Concentrate on the capsule ("leaves" around the berries) and note whether they are YELLOW or ORANGE. 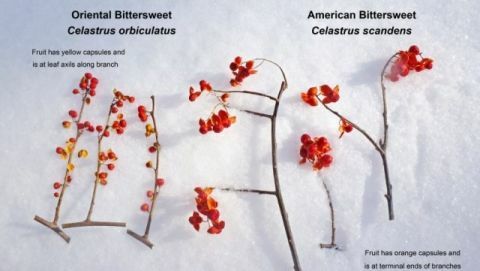 This marks the difference between American bittersweet (a good vine) compared to Oriental bittersweet (a bad invasive weed). You should also look at how the berries hang from the branches--are they only at the branch end (good bittersweet)? Learn more about how to identify it, and how to get rid of it in the two videos below. Got some in your yard? Report it! Email a report with a GPS or street location and a photo to Arrest the Pest. Report online via an online form.